The Victoria sits elevated on an acrylic stand. From the very beginning an aura of mystery surrounded the discovery of this gem, which weighed 457½ (old) carats in the rough. Also called the 'Imperial' or 'Great White', it remained the biggest octahedral diamond crystal from South Africa until 1896 when it was surpassed by one weighing 503¼ (old) carats that was found in the De Beers Mine. "Sir. This gem of blue-white colour, similar to the finest stones from the Jagersfontein Mine, which is said to be (and most probably is) the true locality of this gem. There is somewhat of a mystery attached to the true origin of the stone, and from the secrecy displayed at its first discovery, it is not improbably that it has been procured through an 'illicit' at the mine from which it is reported to come. "Report says that it was purchased in the first instance for £15,000, and the syndicate now possessing it ask £200,000. Should it prove to be the wonderous gem reported this latter sum is certainly not too high a valuation for such a marvellous and unique stone." That letter drew the following forthright reply which appeared two days later. "Sir: It may preserve your columns from further fiction, may satisfy public curiosity, and give the unrivalled beauty of a fair start in society if the simple pedigree is given, for which I am indebted to a letter, dated 30 June, from my near relative, Mr. Allenberg, of Port Elizabeth, who shipped the stone for sale to the London market. "The diamond was found on a Dutchman's farm in the Orange Free State by one of his 'belongings' and kept in secret by him for nearly a year, purely from dread that, if known, his farm would be 'jumped' by a crowd of diggers and he driven from house and home. At length - by what arrangements is not given in the letter - an old friend of Mr. Allenberg's obtained sight of the stone and induced the owner to forward it for sale. "It is true that the stone was sold to a syndicate of the leading diamond merchants in London. There has been no secrecy from first to last. "The guess of the price in The Times is not correct." Despite the affirmative tone of the second letter, experts continued to harbor doubts about the source of the Victoria. In this connection, it is important to note that while the Jagersfontein Mine definitely did produce many fine white stones, they were nearly always cleavages in the rough; octahedral diamonds were characteristic of three of the Kimberly mines: De Beers Mine, Kimberly Mine and the Dutoitspan Mine. "It is, however, believed that it was found by someone at one of the Kimberly mines, South Africa. The first intimation that any of the various mining companies had of its existence was when they heard of its safe arrival in London. It is generally supposed that in the month of June or July 1884, the stone had been found by one of the surveillance officers if the Central Mining Company in the Kimberly mines. It being his duty to search others, he had the privilage of not being searched himself, and so the stone was passed through the searching-house, and he was afterwards supposed to have found means of communicating with four illicit diamond-buyers. Owing to the stringency of the diamond laws of Griqualand West, the trading in rough diamonds is forbidden to any one not owning one of the 'patents' or 'licenses', as they were called, costing £200 and a guarantee of £500. All the purchases made by them must also be entered into a special registry, and are duly signed each week by the police authorities. £3000 was the price paid to obtain the stone from the first processor. To prepare themselves for the ordeal of transporting the stone out of the district, they assembled at night, commenced drinking, then gambling, and after a night's debauch two of the party had lost their share in the big stone. The other two reached Cape Town in safety, where the diamond laws are not in force, and from a dealer there received £19,000 cash for their stone. An outward duty of one-half percent is collected on shipments of diamonds from Cape Colony; but this diamond is siad to have been carried by one of the passengers of a mail steamer, and was hence undeclared. We next hear from it in London, causing considerable sensation in Hatton Garden, the great diamond market. After considerable time had been spent trying to find a capitalist who could afford to buy such a gem, it was at last arranged by a former resident of the Cape mines to form a company of eight persons, who bought the stone together for £45,000 cash, on condition that if they should dispose of it each should receive a ninth share in the eventual profits." The Victoria appears bluish in this dark photo. One reporter said it had a "greenish flash." Mr. Kunz went on to add that it was finally decided to cut it into the largest possible brilliant, rather than into numerous small stones, and that Amsterdam was selected as the place where the gem could best be cut. The Victoria was despatched to the firm of Jacques Metz where a special workshop was constructed for its cutting. First, a piece was cleaved off that yielded a brilliant of 19 (old) carats. The stone was later bought by the King of Portugal; its location is unknown today but it may be one of the brilliants among the former Crown Jewels on display in the Ajuda Palace in Lisbon. The cutting of the largest piece of the Victoria began on April 9th, 1887, in the presence of the Queen of Holland: the operation took about a year because the preliminary processes in cutting a diamond were by-passed and it was polished solely on the scaife. A great deal of time was taken by the cooling of the stone as it became heated after an hour's running on the wheel. The cutter was Mr. M.B. Barends. The finished gem was a slightly rectangular cushion cut with 58 facets, including the table and the culet facet. It measured 39.5 mm long, 29.25 mm wide and 22.5 mm deep. In his article, Mr. Kunz noted that the form of the Victoria was not entirely even and that on one side of the girdle there was quite a flat place, a natural unpolished surface, necessary, in cutting, to preserve the large weight of the stone. The diamond weighs 184.5 (metric) carats. The Sixth Nizam of Hyderabad, Mahbub Ali Khan, bought the Victoria which was believed to bring good luck: this belief later prompted the Prince to reject an offer for it from the Aga Khan. But the Nizam's purchase was to inaugurate a second period of mystery surrounding the diamond. When the British withdrew from India in 1947 the Indian sub-continent was partitioned into India and Pakistan, the ruling Nizam of Hyderabad, the son of the buyer of the Victoria Diamond, chose to remain independent, refusing to join either of those two countries. Eventually, after the breakdown of negotiations and subsequent armed interventions by Indian forces, Hyderabad acceded to the Indian Union as a state in January of 1950. Later Hyderabad was divided among three neighboring states. The Nizam, General His Excellent Highness Sir Mir Osman Ali Khan Bahadur, who had loyally supported the allied cause during World War II, retired to Bombay (now Mumbai) to live on a pension granted to him by the government of India. It was said that the Nizam lived so frugally that his personal expenses amounted to a mere 7s. 6d (37½ cents) per day. The Nizam placed his collection of jewels, stated unofficially at the time to have been worth between £13,000,000 and £15,000,000, under trust, dividing them into two groups: the first was made up of forty pieces which the trustees could sell; the second and slightly larger group consisted of pieces that were not for sale, unless, in the Nizam's own words, some unforseen calamity should befall his family. There was no mention of the Victoria. 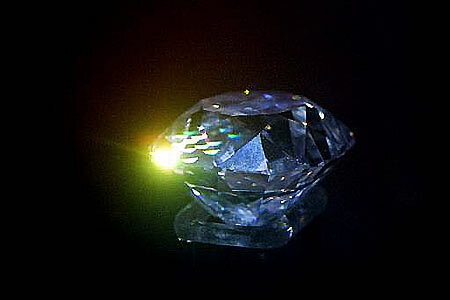 On the other hand a diamond called the Jacob was specifically included in the second category. On more than one occasion there were reports that the Nizam was experiencing financial trouble, caused apparently by his family and his dependants, of whom were said to be more than a thousand. Then in April of 1951 it was stated that the Jacob was to be offered for sale along with other jewels. The India States Minister told Parliament that the proceeds from the sale would be invested in government securities and used to benefit Hyderabad. Simultaneously came reports that the Indian government was refusing to allow any more of the famous jewels to leave the country and that the Jacob Diamond would almost certainly be listed as a "national treasure". Again, there was no mention of the Victoria. Five years later it was reported that the Jacob, then held by the Bank of India, was for sale. An American dealer described it as "white, not blue" in color, adding that it was not the most brilliant gem which he had seen. After the death of the Nizam in 1967 his jewels were again in the news. The trustees wished to sell some of them to help meet the family's staggering tax liabilities. Millionaires flocked to India to attend the sale. Certain conditions were laid down for prospective buyers: anyone who wanted to examine a single jewel on sale was obliged to pay a non-refundable fee of £100; no one could bid without depositing £2000 security which would be refunded only after all transactions had been completed; whatever the price offered for each piece, one-tenth of it had to be furnished with the bid, the remainder within ten days of an offer's acceptance. The auction was stalled because of public outcry. Many Indians felt that, like the British Crown Jewels and the jewelry collection housed in the Smithsonian Institution in Washington, the jewels that had belonged to the Nizam of Hyderabad should be reguarded as part of the country's national heritage and therefore, should be preserved in India. There the matter rested until 1993 when the Indian government decided to buy the fabled collection. The two sides reached final agreement on the price and the government said that payment for the jewels would be made in six installments, but the trustees rejected this arrangement and their argument was upheld by the Supreme Court, who directed the government to pay in full. Once again events stalled until the Supreme Court intervened at the behest of the trustees. It forced the government's hand by directing that the trustees could invite bids from foreign buyers. Earlier the Supreme Court had given a deadline but yielded to an appeal from the government for more time. The Lower House of the Indian Parliament gave its approval for the funds to buy the collection but the Upper House did not get around to ratifying decision in the session. The impass was fortunately resolved by the discovery of a loophole in the parliamentary rule book which allowed the money to be handed over to the parliamentary rule book which allowed the money to be handed over to the appropriate government department; all that was left to do was to work out the final details of the agreement. The government was told to produce the cash by January 16th, 1995, or the deal would expire. On January 12th, the Indian government paid approximately Rs 218 crore ($70 million) for the Nizam's jewels, which was made up of 137 items. Privately the trustees and beneficiaries considered that the best price had not been obtained for the collection, which had earlier been valued much higher by international auctioneers. "Jacob was notorious, from Simla to the fasionable spa of Homburg, for his powers of magic. The gullible credited him with the ability to walk on water and even the least credulous granted him powers of mesmerism and telepathy. It was generally believed by British and Indians alike that he practiced white magic, and it was variously reported that he was a Jew, an Armenian, a Russian agent, a British agent. It was obvious to all that he was the most important dealer in jewels and antiquities in India, and known to a few that he had in fact undertaken missions for the Secret Department of the government of India. He travelled by private train. His little store in Simla was a pantechnicon of riches, blazing with gold and smokey with incense, and in it Jacob squatted, pale and subtle, keeping a diary full of secrets." "Jacob had agreed to purchae for the Nizam a famous diamond kept in England, then called 'the Imperial' (and later 'the Jacob'), for the sum of three hundred thousand pounds, half of which His Highness had paid as a depost. Now Jacob delivered the diamond in person with only the Nizam's valet as a witness. He left, with the Nizam still owing half the purchase price. Unknown to Jacob, the Resident had heard about the transaction A worthy, wordy man whose lust was legalities and property, the Resident sought to save the Nizam's almost bankrupt government from the folly of buying yet another bauble. The Nizam froze. He was not allowed to pay the rest of the money and he would not return the diamond. He wrapped it in an ink-stained cloth and dropped it into a drawer. Jacob was forced to defend his investment by suing a Calcutta court; though he won the case, he was broken financially. His legal expenses were great. No prince in India would deal with him again and he died in penury, even his magic spent, in Bombay." Sotheby's valued the jewelry collection at $162 million, and Christie's at $135 million. After the purchase of the jewels by the nation of India in 1995 they were displayed several different times, but the most publicized exhibit opened on August 30th, 2001. The gems went on display in Hyderabad, India, along with the Victoria Diamond, which is considered the centerpiece of the exhibit. The exhibit closed on October 30th, 2001, but in February of 2002 it opened again, with enthusiastic talk of it becoming a permanent exhibit.